If you want to combine adventure and sightseeing, there’s no better choice than Maui zip line tours! Where else can you enjoy both the beauty of a mountaintop view and the exhilaration of zipping down from it? 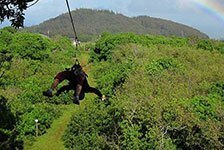 You can find the best Maui zip lines right here at ReserveHawaii.com, all at great low prices. Book your Maui zip lines tour today!